Among the many challenges that a modern marketer faces, ad fraud is right up there at the top. The Methbot report, released by WhiteOps, explains how Russian fraudsters led marketers into spending $5 million a day on video ads that actually went unseen! You can do a lot to take control of your ad campaigns. In this guide, I will cover 11 methods to reduce the risk of ad fraud. 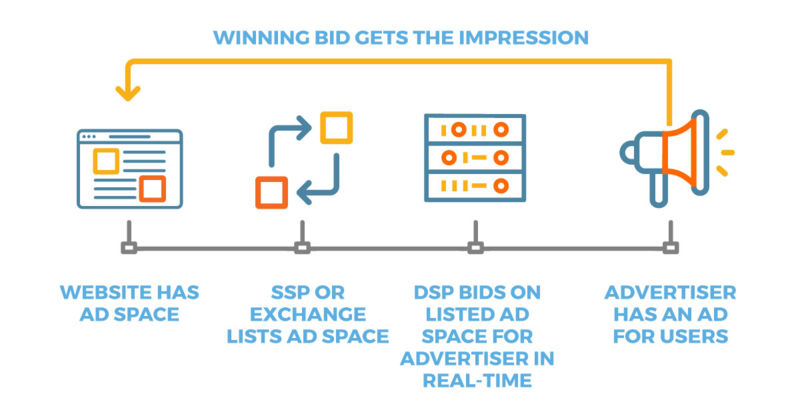 A DSP (demand-side platform) is a system that lets digital ad inventory buyers manage several ad exchange accounts from a single interface. Adding just one additional layer of verification via trusted DSPs in your ad spend will save you from ad fraud. I recommend that you work with a DSP that offers a fraud-free guarantee. Google, for instance, offers credits (media-back) and refunds (money-back) to customers when its DSP purchases fraudulent media from exchanges. In fact, The Wall Street Journal carried a news story in its 21 May, 2018 edition, explaining how Google has started refunding customers for fraudulent ad-clicks. Google is working with 100+ ad exchanges, asking them if they’ll also refund the entire media spend to buyers in case of ad-fraud. As a digital marker, you need to follow independent market reports that evaluate DSPs. G2 Crown Grid offers a good analysis of the marketplace, which will help you identify trusted DSPs. If you’re only beginning with digital advertising campaigns, you’ve got a tough road ahead. Why do I say so? Because experienced marketers know their numbers like the back of their hands which makes them easily able to identify abnormalities in their traffic metrics. Low scores on engagement metrics such as low time-on-site, high bounce rate, low average session duration, etc. Whether you use Google Analytics to track all these metrics, or any other analytics tool, the success factor here is your intuition to identify abnormal trends, and then dig deeper to check if it’s linked to ad fraud. In AdWords, you already have access to advanced features such as competitor analysis, targeting, exclusion, and dashboards to optimize your campaigns. In the next sections, I will explain how you can use some of these features. Next, seek the services of an ad verification or ad management company. These service providers capture all your ad-spend data and provide easy-to-use dashboards to evaluate the information. Some of the leading names in this marketspace are Moat, Integral Ad Science and DoubleVerify. 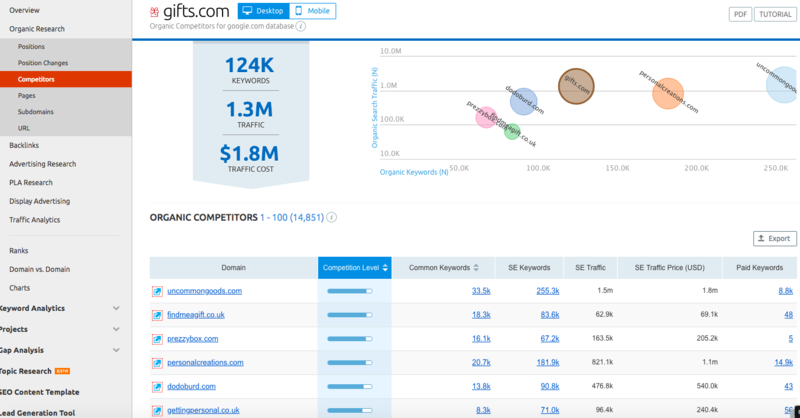 It gives users a bird’s eye report on ad-fraud measurement metrics. It aligns your ad server numbers and your publisher’s ad server numbers for error-free reporting. 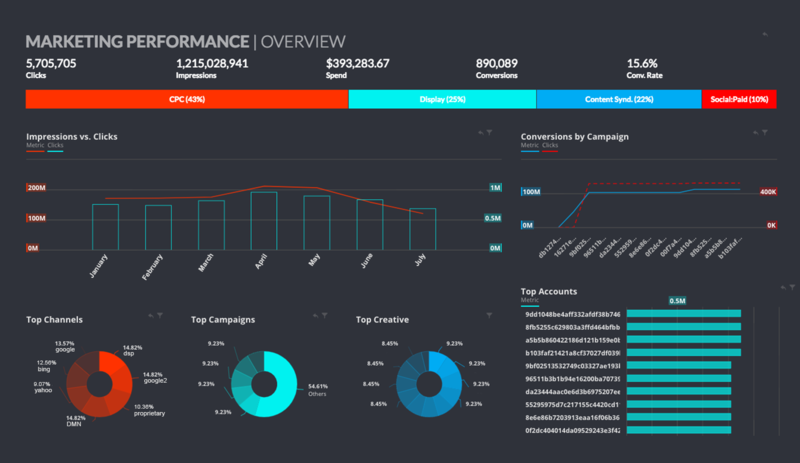 It integrates with leading ad verification systems and offers you intuitive dashboards to detect possible ad fraud. If you’re not watchful, you could be burning hundreds of ad-spend dollars every day for ads placed on fake websites. Here’s how to identify such instances of ad fraud. 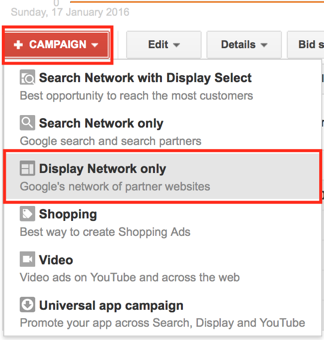 Go to Google Display Network campaigns in your AdWords account. Under the Display Network menu, look for the Placements tab and click it. The above method works if you have a limited number of display websites (sites where your ads are shown) to manage. But if the number runs into the thousands, it’s a bit impractical to check even a hundred of them for possible ad fraud. Let’s say you are looking for placements related to online gifts and you find out that gifts.com is a leader in the space. Visit SEMrush and enter gifts.com in the search bar. Now click on the Competitors section under Organic Research. Here, you will find a list of leading organic competitors of gifts.com, and now this list of competitors becomes your whitelist for your ad campaign. 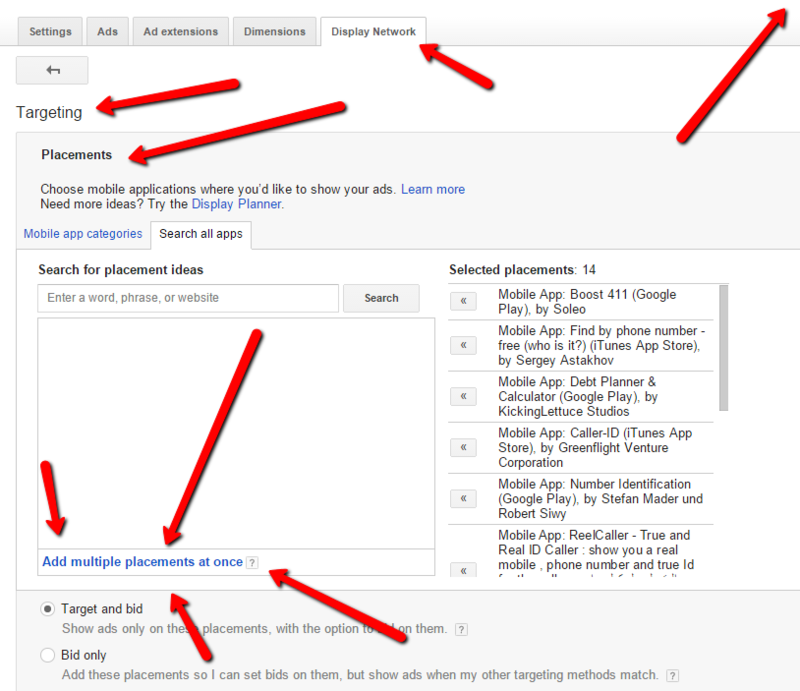 Go to Display Network > Targeting > Placement > Add Multiple Placements. Check the ‘Target and Bid’ radio button to make sure that your ads appear only on the whitelisted websites. Also, uncheck the option called “Let AdWords automatically find new customers” to prevent AdWords from automatically placing your ad on other websites which have shown similar costs per customer. Ad targeting is very easy on social media platforms. There are no third-party publishers involved here. I’ll demonstrate using Facebook as an example. Go to Ads Manager in your Facebook account. Proceed to the the Audience pages. I’ll take the first option. 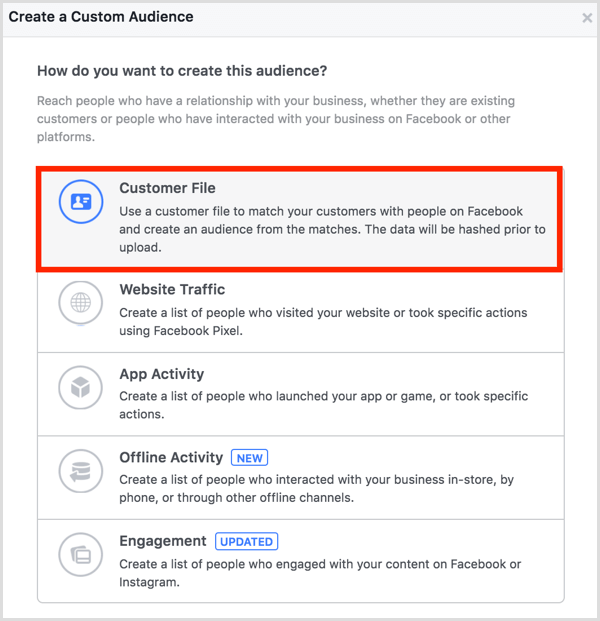 Click on Create Audience, and select Custom Audience. Upload a file with the email addresses of your customers. There are other options, such as web traffic and app activity. 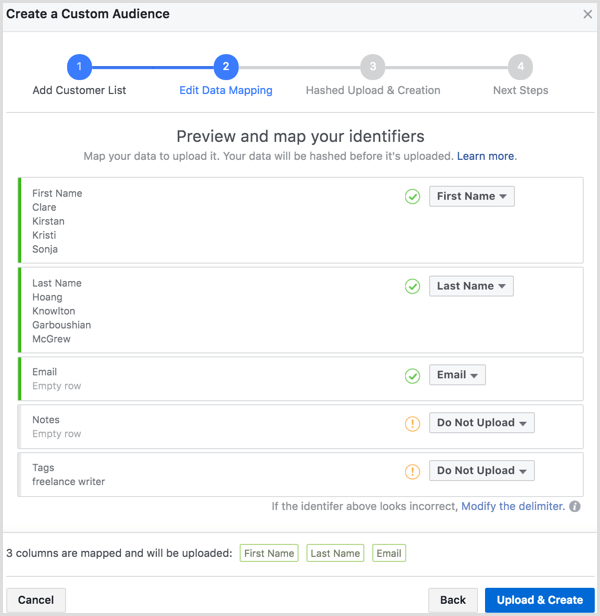 Follow on-screen instructions to name your audience and map the data to Facebook’s format. Finally, review and then click on “Upload and Create”. 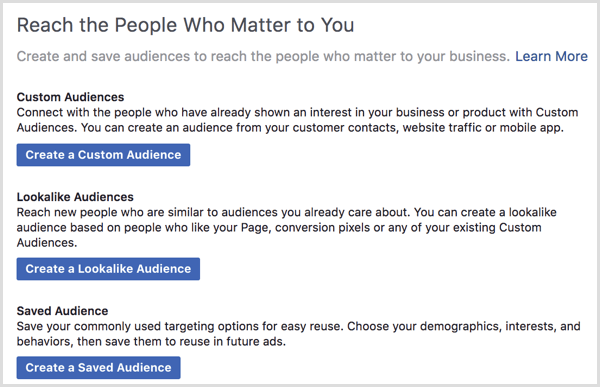 You can now use this custom audience to make sure that your ads are seen by the most relevant users. This drastically decreases the chances of ad fraud because you are already aware of your target audience since you are custom picking them. Manual click fraud (hourly wage workers from underdeveloped countries manually clicking on ads) and a huge chunk of automated click fraud (bots clicking on ads) can be avoided if you can exclude the problem IPs. This makes IP inclusion important to protect yourself from click fraud. Start by extracting the entire IP log for your website. You can simply Google “[your web development/host] IP log” and you’ll either get the link or an add-on to give you the IP list. Once you get the list then you need to extract the data to an Excel spreadsheet. Use pivot tables to find out the number of recurrences of an IP address within a day. Create hour-wise chunks of data, and see cases where an IP address reoccurs multiple times within an hour. 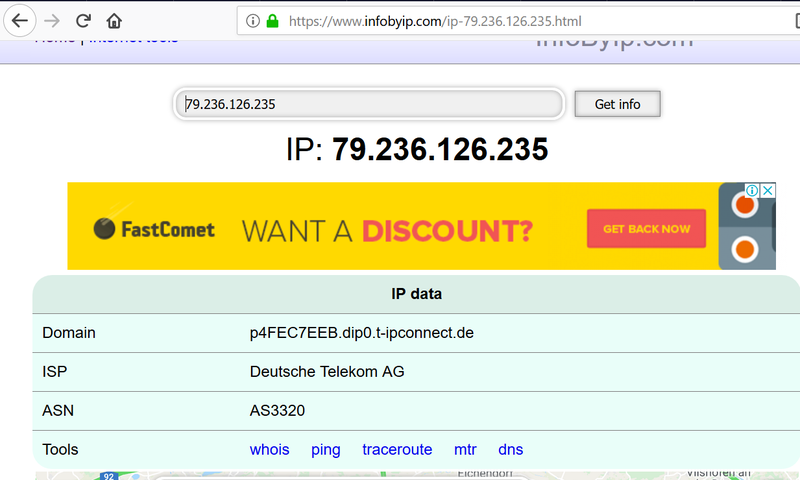 Such suspicious IPs can be checked further; use InfoByIP.com to check their geographic location. You will need to exclude IP addresses pointing to cafes, libraries, universities, etc. That’s because these are not places from which somebody would launch a click fraud against you. Go to your AdWords account and go to the Settings tab. Click on the campaign for which you’d want to exclude IPs. Go to Advanced Settings > IP Exclusions. 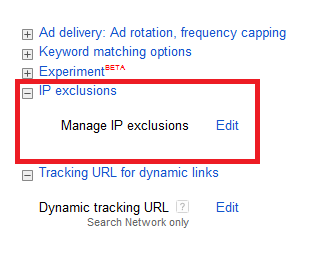 Click on Edit, and then Manage IP Exclusions. In the next window, you can add up to 500 IPs. 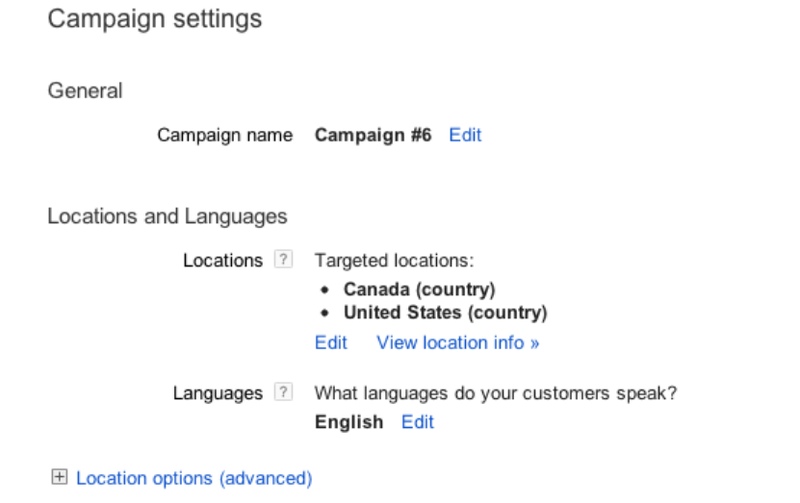 In AdWords, go to your Campaign > Settings. Edit the “Locations” setting and go to Advanced Search > Bulk Locations. In the box, you can add up to 1,000 locations to be excluded. Once done, select country codes for these locations, and click “Search”. Review the list, click “Exclude all matched locations”, select “Done”, and then click “Save”. 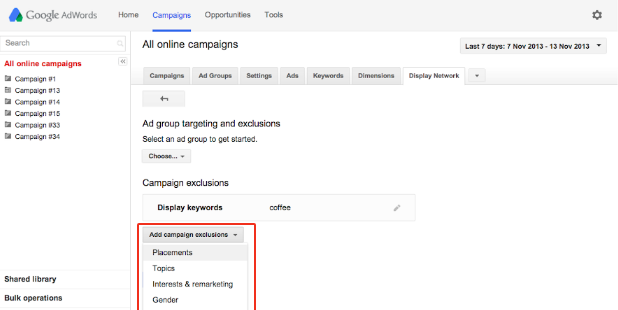 In AdWords, go to Campaigns, then head over to +Campaigns > Display Network Only. Keeping the “Marketing objectives” option checked, put a check on “Buy On Your Website”. Choose the campaign name, budget, and strategy, then click “Save”. Enter group name and bid. Choose “Interests and Remarketing” in “Choose how to target your ads”. Go to “Select Category’ and choose “Remarketing Lists”. Use “Set up remarketing” to create your remarketing list. 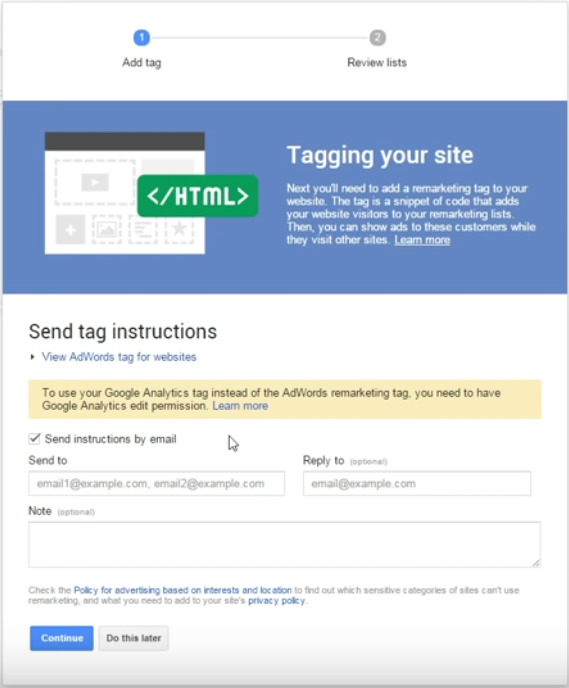 AdWords will generate and send you a tracking code that you can add to your website. In Your AdWords account under the Remarketing Lists tab, look for the “All Visitors” tab. Companies that are a part of the programmatic advertising ecosystem are striving hard to beat ad fraud. Advertisers can do their bit to add additional layers of protection on top of what these companies are doing. Ask vendors if they can filter the ad inventory as per your whitelists (the ones created using insights from all the different methods we’ve covered). Ask if they use machine learning to continually improve their ad to platform matching. Machine learning is the way to fight ad fraud, so work with advertisers who are pioneers of the same. Ask vendors if they can use only the Ads.txt file (Authorized Digital Sellers). This method makes sure that each web page adds a file to its root domain, giving the details as to which SSP (Sell Side Platform) is able to offer inventory, and the Placement ID. This ensures that correct data is accurately passed from the SSP to the publisher ID. Ask vendors if they have pre-bid options, wherein bids are served only if the inventory meets certain criteria. 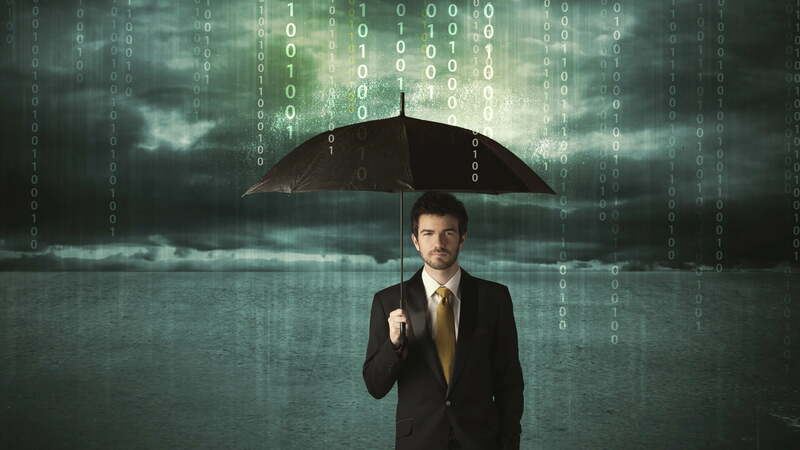 Click fraud can kill your digital advertising efforts without your even knowing it. You need intelligent manual monitoring systems, third-party tools, and smart targeting ad exclusions. 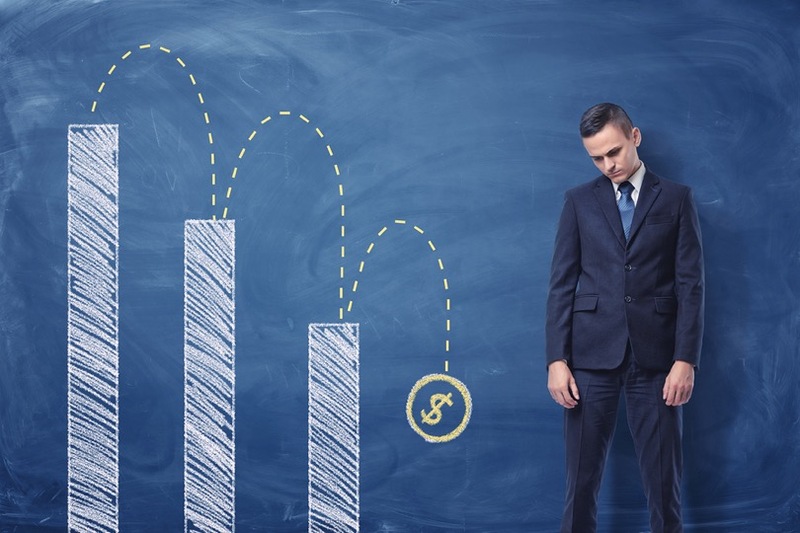 These 11 tactics help you get the most of your ad spend.